Did you ever ask: "Where can I get the original CLIC-R® clamps for my fuel hose?" Ensure a tight fitting between a hose and a pipe-end at temperatures ranging from -30 to +130°C. It is a single-band clamp that stands out by its light weight, compactness, easy and quick fitting (as all it takes is to clip the latch on the latch lock), as well as by its circularity which ensures an even distribution of the clamping force. CLIC-R® clamps are used by many European OEMs. ✓ Excellent circularity: even distribution of the clamping force preventing leakage. ✓ The locking system of the CLIC® clamp ensures a robust tightening. ✓ The CLIC-R® clamp is light and compact. ✓ Quick and easy fitting (1 second) with manual or pneumatic pliers. ✓ The CLIC-R® clamp is removable and reusable (if disassembled with care). This clamp is particularly recommended to tighten hoses on fuel, air, water systems, as well as transmission/steering boots and airbags. 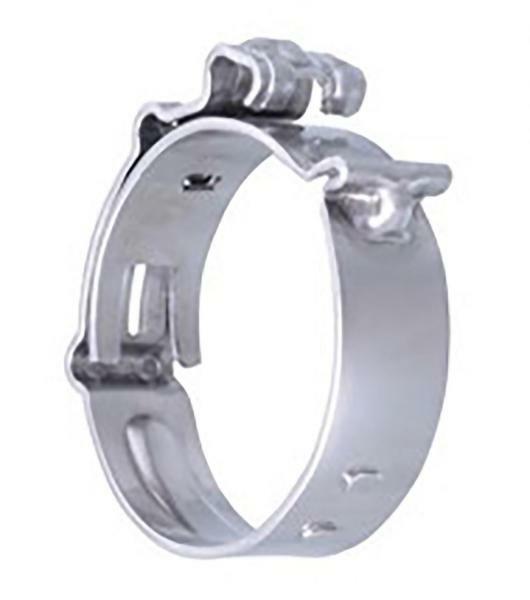 Besides the advantages of the standard Clic® clamp, the Clic-R® clamp has a capacity reserve designed to compensate for the tolerance ranges of the hoses and spigots to be tightened. All other industrial applications, electrical appliances, automotive aftermarket, domestic plumbing (sauna, bath,…). All rubber, thermoplastic, TPE, silicone,… hoses.